FIFA 2018 World Cup is just around the corner already. 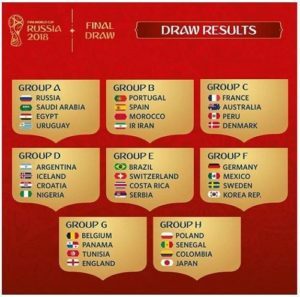 Final Draw took place on the 1st December in Moscow featuring 32 teams and 8 groups. The match schedule is ready. You can check it out here. Russia will open this exciting tournament playing against Saudi Arabia on the 14th June at Luzhniki stadium in Moscow. Have you purchased your tickets already? If not you – hurry up and participate in the second sales phase of random selection draw. What is random selection draw? It’s a chance for you to get the perfect ticket for a match that you want to see, or even multiple tickets for multiple matches. You can get lucky and get selected. All you have to do is fill out an application online. You fill out a ticket application online. In the application you choose the ticket that you want to get and the match you want to go to. Most importantly, you fill out your personal information and you credit card details. If you are selected, the money will automatically be deducted from your bank account as soon as Phase Two is over. So, remember that! And don’t be surprised if some money suddenly disappears from your account. Anyways, you will be notified about everything via e-mail. Random Selection Draw Sales Period (phase 2) has already started on the 5th December. It will end on the 31st January 2018, at 12pm Moscow Time. What if I didn’t get the ticket I wanted? If you’re not the lucky one, you can always buy the ticket on the first come first served basis of sales phase 2. This phase will start on 13th March and end on the 3d April. Or if you’re super adventurous you can wait till the last minute, and get whatever is left during the LAST MINUTE SALES PHASE (18 April – 15 July). For information on things to do in cities that will host the matches as well as interesting sightseeing ideas explore our TOURS to RUSSIA tab or contact us to get in touch with our amazing consultants for an expert advice.